Seriously, it's winter. It is supposed to be cold. Plants and animals are in hibernation mode. And yet we, stubborn humans that we are, refuse to accept the fact that the skies will be gray. Snow will fall. It will be colder than we remember. And staying inside is a good idea most of the time. So why do people experience apathy, depression, anxiety, and utter frustration at the world during the later winter months? Does the angst come from a realization that the fun and family times during the holiday are over and one must pay for one's retail sins? Does the weather remind us of our fragile existence our final demise? Maybe. But no matter what the skies beckon, we can attain a reasonable sense of positivity and peace during this time of year. For some, it is a time to focus on self and to strengthen our spirits and minds by fasting, giving up something for Lent, or simply exercising more and eating less. For others, it's a time to lament the limitations of the season. It is simply a choice. A choice we must all make. A conscious choice. Do we want to be happy and at peace? Or do we prefer the drama of complaining and suffering? Remember this choice the next time you utter that final complaint about the weather changes or the dark days or the high electricity bill....if you can't change it, why bother worrying about it? Try something new. Get a job! Read. Create a new painting. Sculpt a snowman. Invite someone to lunch. It's your life and you really do have a choice. Just do it! As I searched for images to complement this little sermon, I found this little book! 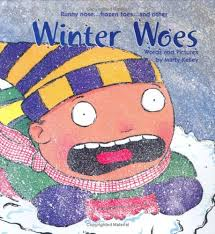 Obviously, kids need to know about the worry of winter, too! Let them know they do have a choice to NOT worry!